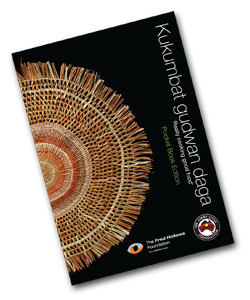 Kukumbat gudwan daga (Really cooking good food) is a a cookbook full of healthy recipes and was developed by the Fred Hollows Foundation and the women's centres of Manyallaluk, Gulin Gulin and Wugularr. The pocket booklet edition was developed in partnership with the Jimmy Little Foundation and can be downloaded by clicking on the picture below or you can view the recipes on line using the menu on the left. Some of the recipes have videos showing them being prepared and cooked.